Pearl Millet is the world's hardiest warm-season cereal crop, grown on an estimated 31 million hectares in the arid and semi-arid tropical and sub-tropical regions of Asia, Africa, and Latin America. More than 90 million people who live in the drier parts of Africa and Asia depend on pearl millet for food and income. Pearl millet is a dependable nutritious source of food, not just a source of energy but also a good source for other dietary needs, especially micronutrients. In addition, pearl millet stalks and leaves (stover) are a valued source of fodder for farm animals. The crop is well adapted to agricultural areas that are afflicted by severe drought, poor soil fertility, and high temperatures. It also grows well in soils with high salinity or low pH (highly acidic). 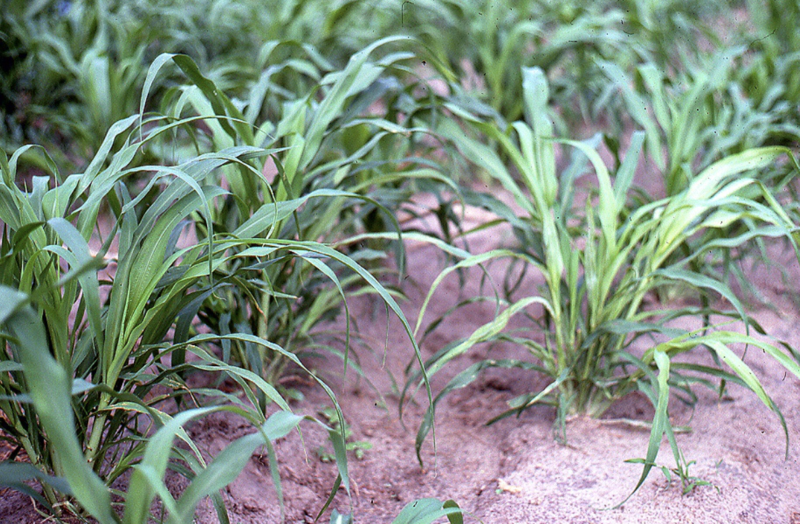 Because of its tolerance to such challenging environmental conditions, it is often found in truly marginal areas where other cereal crops, such as maize or wheat, can't survive. [Click here to go to Pearl Millet crop page]! Pearl millet downy mildew is a devastating disease that can totally destroy infected plants and cause up to 100% grain loss in highly susceptible cultivars. 2. How is it Identified? 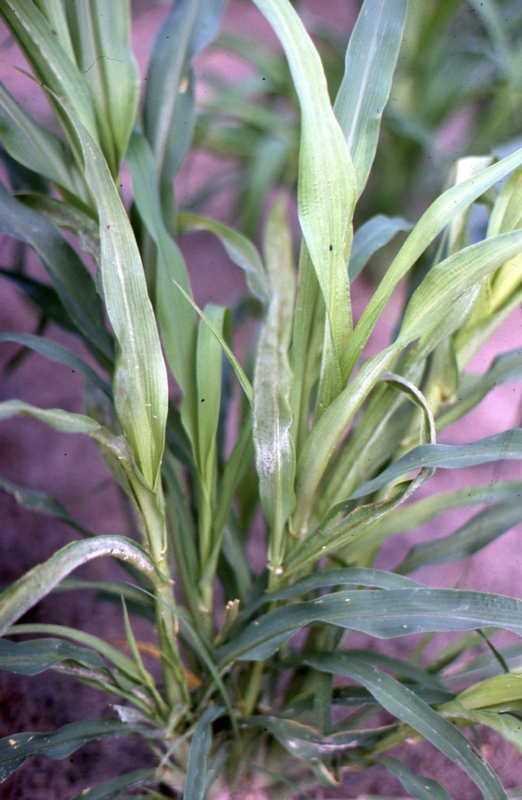 The disease is readily identified by characteristic symptoms at all stages of growth. The following photographs and diagrams provide a gallery of the key symptoms to enable growers and their advisors to identify the disease in the field without a doubt, at various growth stages. 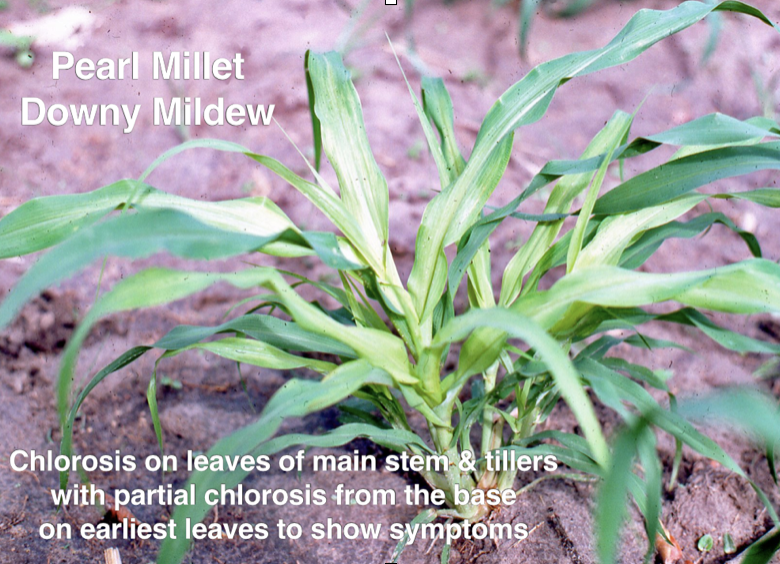 Fig 01 - 06: Tillering pearl millet plants showing chlorosis (yellowy-whitish regions) on the lower (nearest to the stems) portions of the first leaves to show symptoms. 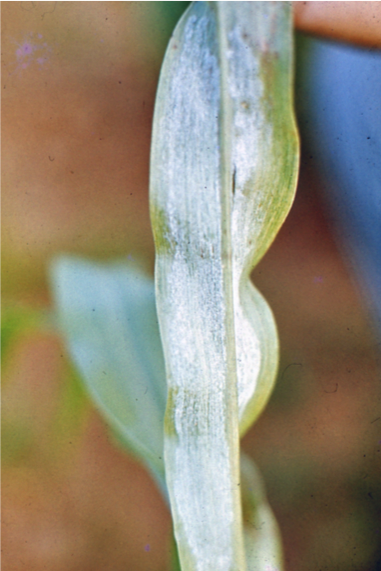 Subsequent leaves have more and more of the leaf area with the yellowy-whitish discoloration until the whole leaf is diseased. Fig 07 - 09: Individual diseased leaves showing the characteristic white powdery or downy growth of the pathogen, which consists of microscopic spores (sporangia) and the stalks (sporangiophores) on which they develop (see Biology & Epidemiology section below). Fig 10 - 14: Characteristic “green-ear” symptoms, with the grain-bearing heads transformed into whip-like yellow to green vegetative structures, with no grain produced. The grain-bearing heads can be fully or only partially converted to the leafy structures, and if partially transformed the diseased part is always at the base of the head. 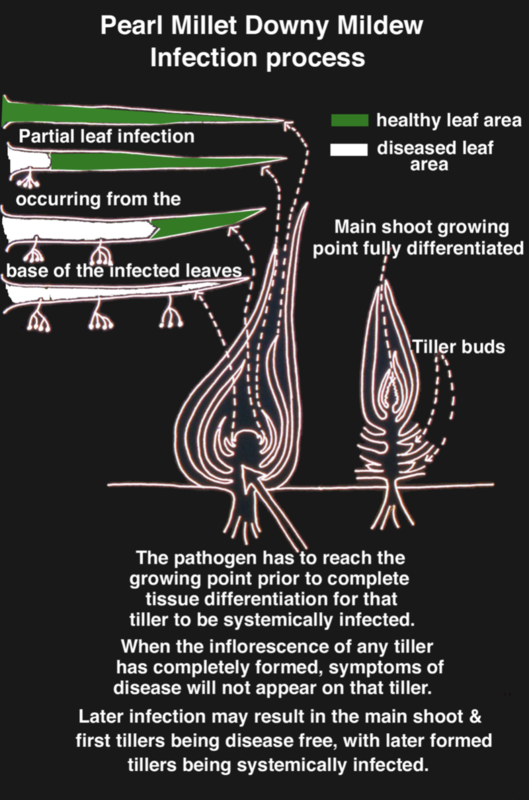 Fig 15 & 16: When the disease develops in young plants it can completely kill the diseased plants or individual tillers, leaving gaps in the crop, with non-diseased plants adjacent. Fig 15: Susceptible cultivars showing symptoms. 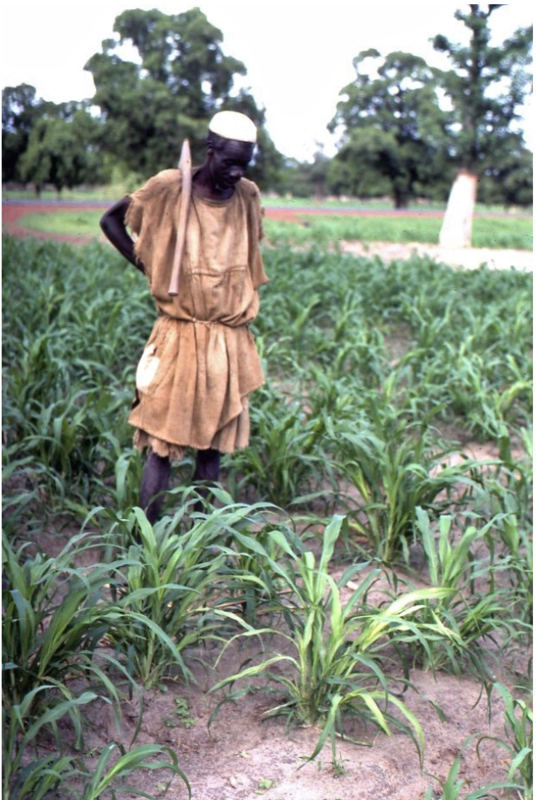 Fig 17 & 18: When highly susceptible cultivars are exposed to high levels of disease the entire crop can be so damaged that no grain-bearing heads develop (fig 17) or the crop may be totally destroyed (Fig 18 an Indian pearl millet hybrid in Northern Nigeria with local resistant cultivar in background). 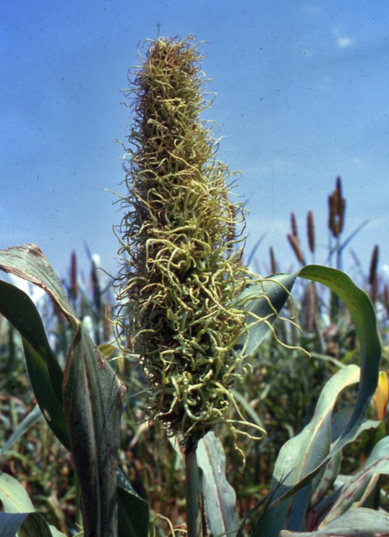 The pathogen causing pearl millet downy mildew is a biotrophic microscopic Oomycete named Sclerospora graminicola (Sacc.) Schroet. 2. What crops does it infect? 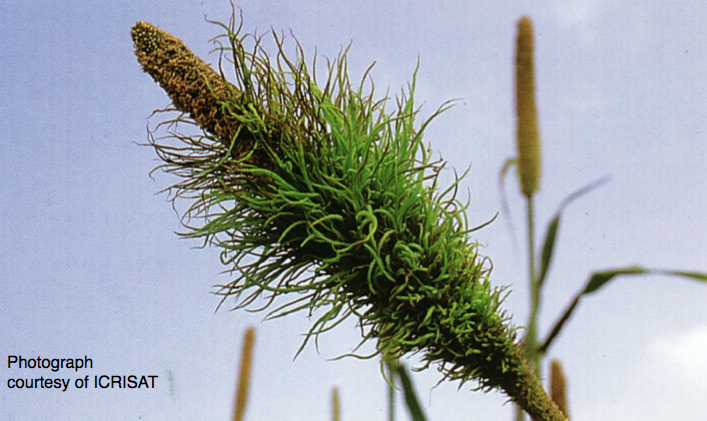 In nature it causes disease in two crops: a) pearl millet and b) foxtail millet (Setaria italica). However, it exists as two distinct pathotypes or varieties: the pearl millet pathotype, which does not infect foxtail millet and the foxtail millet pathotype, which does not infect pearl millet. 3. Where does it occur? The pearl millet pathotype is recorded from large parts of Asia (India, Pakistan, China) and virtually the whole of Africa where pearl millet is grown. The pearl millet pathotype has not been reported from the Americas nor Australia. 4. How does it survive in nature? As a biotrophic organism, it can survive outside its living host plants only as thick-walled resting spores called oospores. 5. Where & how are oospores formed? Oospores are formed in diseased host tissue through sexual reproduction between different mating types (i.e. the pathogen is heterothallic). This allows mixing of genes to create genetic variability which enables the pathogen to respond to selection pressures such as the introduction of resistant cultivars, and this has implications for disease management through the deployment of resistance and/or the use of fungicides. 6. How do oospores get into the soil & contaminate seeds? The oospores are released into the soil as the host-plant dead tissues fall to and break down in the soil, and they become mixed with seed when the grain-bearing heads (panicles) are threshed with diseased tissue containing oospores. 7. How long can oospores survive? 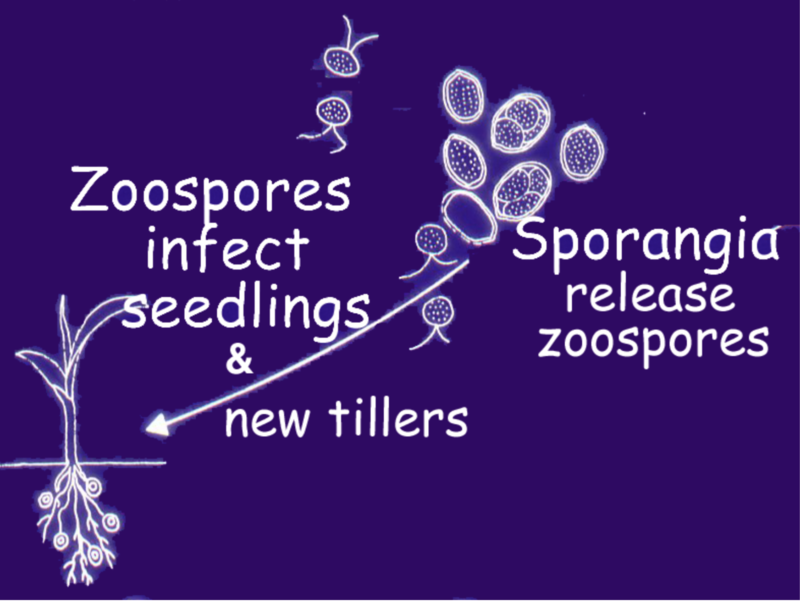 Oospores can remain dormant but infective in the soil for at least 10 years. 8. How are oospores dispersed? d) by human and animal movement- oospores can adhere to feet and clothing and be transported to new locations by these means. The most important long-distance oospore dispersal mechanisms are probably air movement and seed contamination. 9. How does infection start? The primary infection in a crop is by germinated oospores that lie dormant in the soil and as seed contaminants until stimulated to germinate by the root systems of pearl millet seedlings. 10. What happens when the pathogen infects? 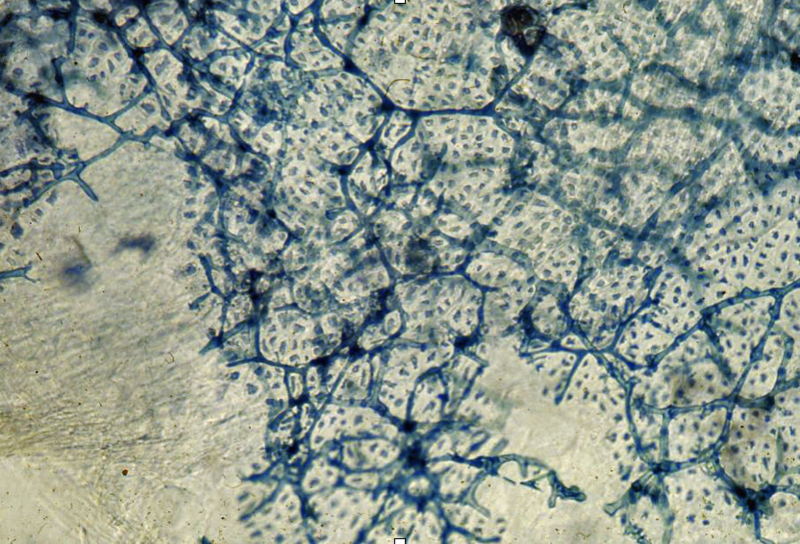 The pathogen grows within the tissues of the plant as intercellular filamentous mycelium which gains nutrients for its growth from plant cells by means of haustoria which push into the individual plant cells. The pathogen then grows into the growing point (meristem) of the plant, infecting all the tissues that form after it invades the growing point, i.e. it becomes a systemic infection. This results in the characteristic systemic symptoms appearing as the infected plant parts develop and unfold. Only tissue that are not fully formed before the pathogen invades the meristem are diseased. 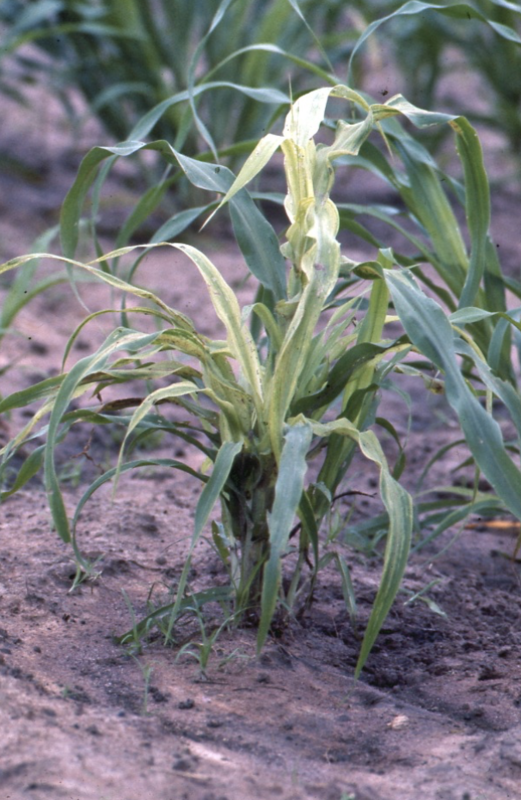 This is the cause of the partial leaf symptoms and partial green ears, and in some cases only later-formed tillers being diseased. 11. 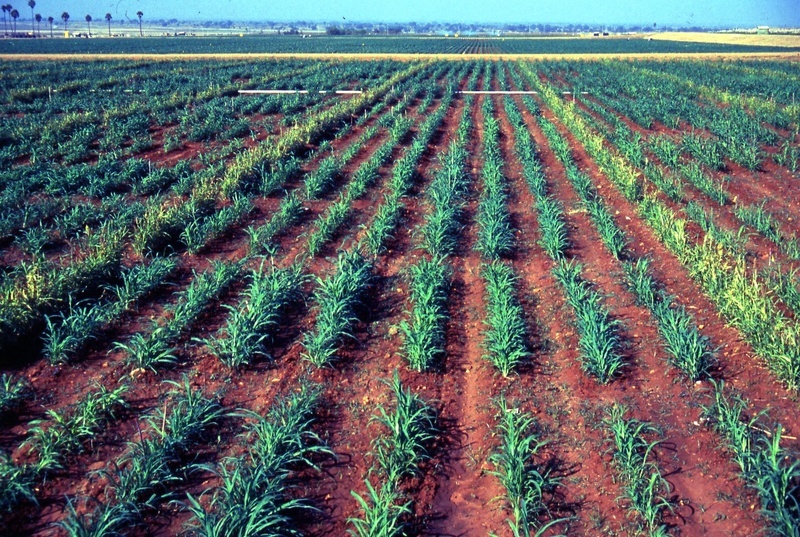 How is the disease spread within a crop? 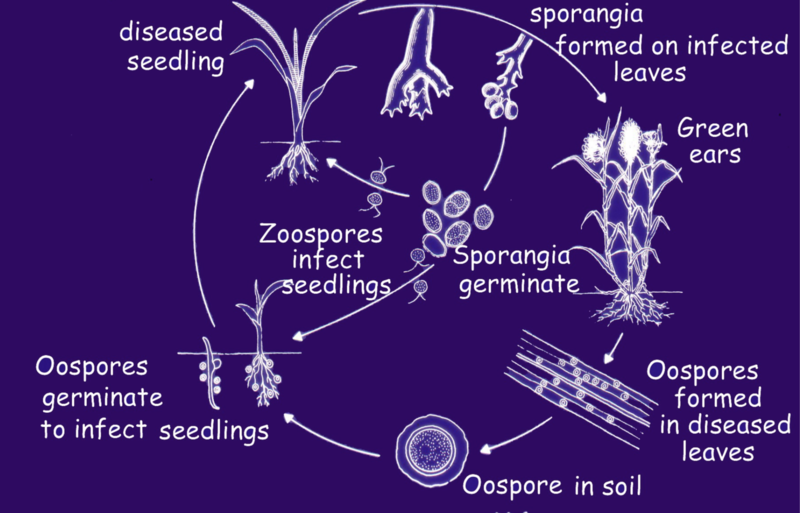 Secondary spread of the disease within a crop is through the production and movement of sporangia which are formed by asexual reproduction on branched stalks (sporangiophores) on the surface of diseased parts of the leaves. The sporangia are dispersed to adjacent plants by wind and rain splash. Under humid conditions, dew on leaves is ideal, they release tiny motile biflagellate zoospores which produce single germ-tubes that infect and invade the tissues of new plants or tillers. 12. How is the life cycle completed? As the diseased leaf and inflorescence tissues become necrotic and die, the pathogen produces the thick-walled oospores through a process of sexual reproduction. This completes the life cycle of the pathogen. 13. 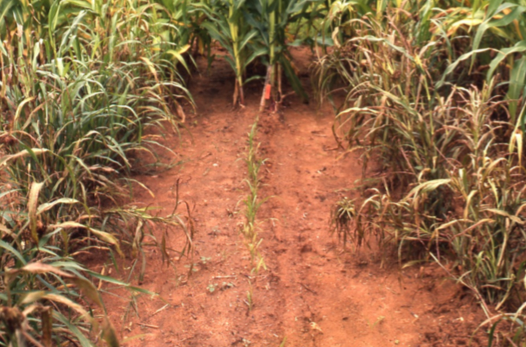 Is there pathogenic variability within the pearl millet pathotype? There is clear evidence, from laboratory studies and from international disease nursery trials, that there is pathogenic variability within the pearl millet pathotype of Sclerospora graminicia, i.e. different pathogenic "races" exist. 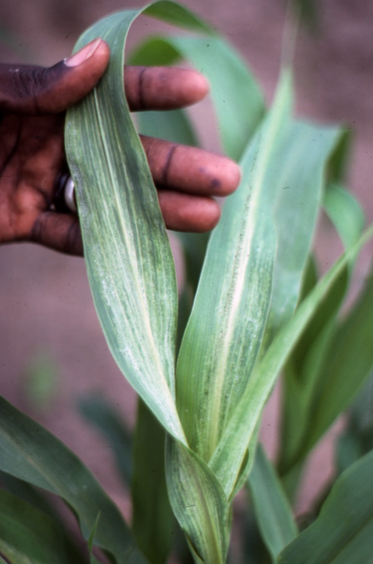 For example, in West Africa, resistant varieties from India can be severely diseased by the local pathogen populations (photo PMDM 18), and cultivars that appear resistant in some locations in West Africa are susceptible at other locations in the region. In India, hybrids developed as resistant to downy mildew have become susceptible after being grown widely for several years, indicating that the pathogen has been able to overcome the resistance through the development of new pathogenic races. 14. Is the pathogen seed transmitted? While seed transmission from oospores on and with the seed has been well demonstrated, there have also been claims that live mycelium of the pathogen can survive in the internal tissues of seed produced on diseased plants, and from there can cause disease in plants grown from the infected seed. The phenomenon of seed transmission has important implications for on-farm management of the disease, and very importantly for the international and inter-regional movement of seed for research and trade. 15. What is the significance of pathogenic variability? a) for adoption of new DM resistant cultivars- new cultivars will need thorough testing within the area to which they are intended to ensure that the resistance is effective there. b) for the movement of seed- The evidence for pathogenic variability within the pearl millet pathotype, and for seed transmission (definitely external and possibly internal) has important implications for the movement of seed. Plant breeders need to find and combine improved traits, and look to seed from the center of diversity of a crop as a key source of such traits. The centre of diversity of pearl millet is the African Sahel, and it is there that the crop and the downy mildew pathogen have co-evolved. Thus is it is in the African Sahel that the greatest variability in pathogenicity is found. Therefore, the international movement of pearl millet seed within and from West African countries should not facilitate the movement of the pathogen and new pathogenic races to areas where they have not before existed. 16. How can pearl millet seed be safely moved without the risk of carrying the pathogen to new areas? iii. treat seed with metalaxyl-containing fungicide @ 2 g a.i.per Kg seed. 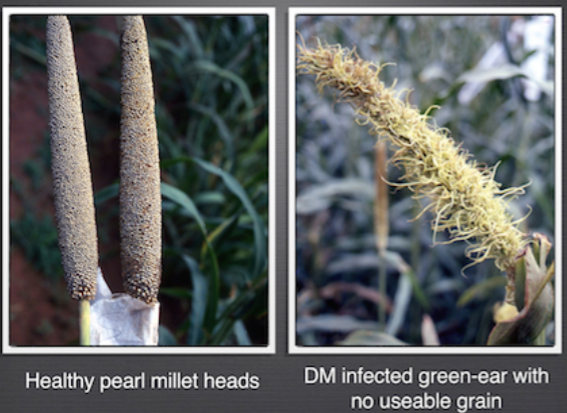 Using these protocols over a 40 year period more than 20,000 pearl millet seed samples have been introduced to India without a single instance of downy mildew detection. 17. 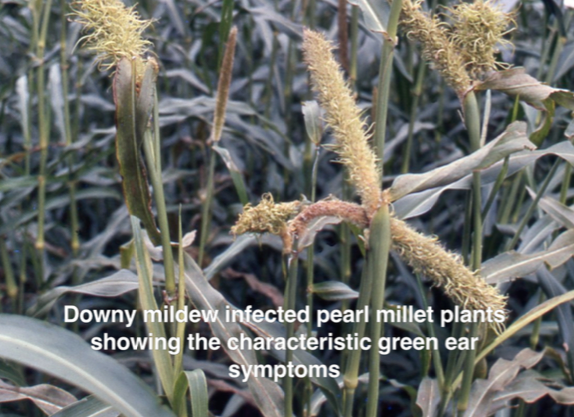 What are the Key Points on biology and epidemiology of pearl millet downy mildew? 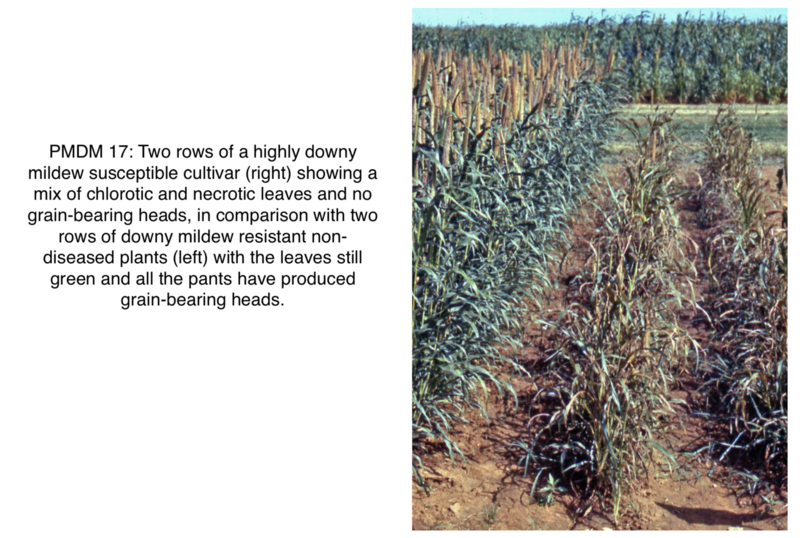 • diseased grain-bearing heads (panicles) develop characteristic "green ear" symptoms, with florets transformed into whip-like yellow to green vegetative structures, with no grain produced. 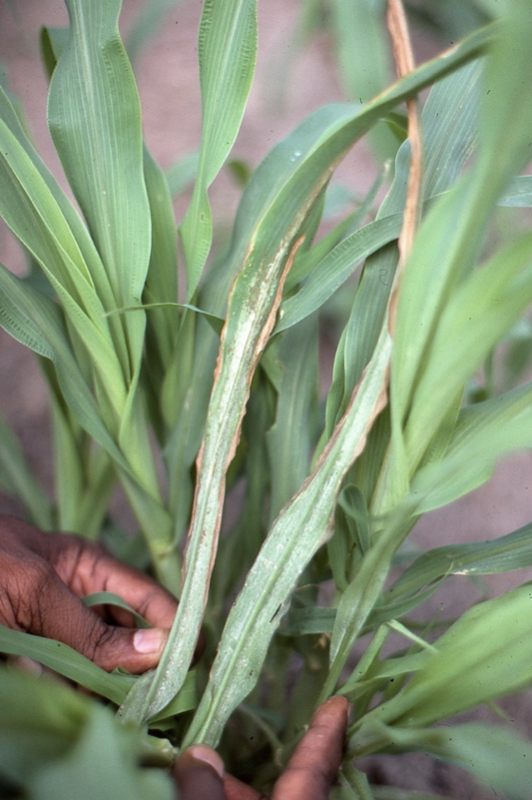 • infected tillers may show leaf symptoms and complete "green ear" or no leaf symptoms and partial or complete "green ear"
1.1 What is host-plant resistance and does it exist for pearl millet downy mildew? Host-plant resistance is the ability of a plant to resist becoming diseased when challenged by a pathogen which is able to cause disease in other plants in that species. Host-plant resistance can have various mechanisms which are conferred by genes within the plant. Host-plant resistance does exist within pearl millet against the downy mildew pathogen and has been harnessed through plant breeding to develop downy mildew resistant cultivars. 1.2 How is host-plant resistance to pearl millet downy mildew detected and used? Host-plant resistance for pearl millet downy mildew is detected by exposing pearl millet plants to inoculum of the pathogen under environmental conditions conducive for infection. Initial attempts to screen for resistance were made using "sick-plots" in which diseased plant tissue containing oospores had been incorporated into the soil. This method had several drawbacks, including: a) the uncertainity of the quantity and evenness of distribution of the inoculum in the soil; b) the time taken to establish an effective "sick-plot"; and c) lack of flexibility in the size and location of the screening area. Once the role of sporangia in the epidemiology of the disease had been recognised, large-scale screening for resistance was possible in which the size and location of the screening area was highly flexible and the inoculum challenge was uniform throughout the screening area. 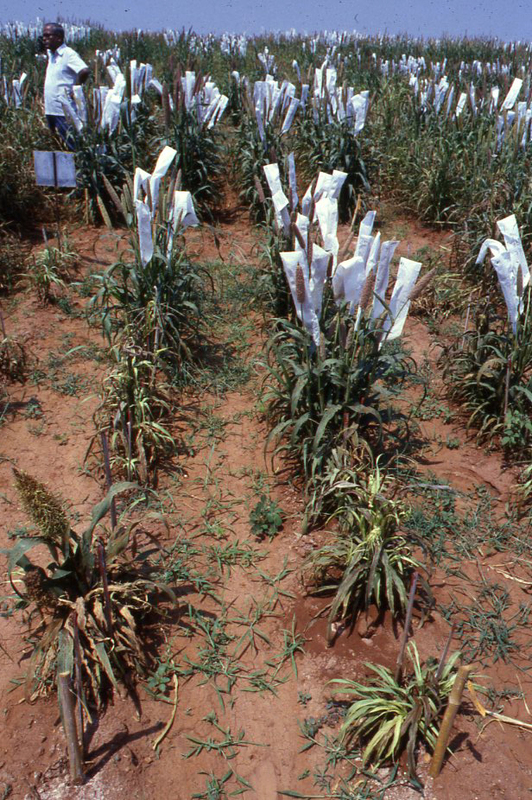 The large-scale screening method for downy mildew resistance developed by the pearl millet improvement team at ICRISAT in India is shown in photographs Fig 27- 28. "Infector rows" of a highly susceptible variety are sown first throughout the screening area leaving room for later sowing of eight rows of plants to be screened between every pair of infector rows. The disease is promoted in the infector rows using pots of pre-infected plants placed at regular intervals along the infector rows with overhead sprinkler irrigation used to create the necessary humidity for sporulation and disease spread. When the disease is developing uniformly in the infector rows, and 50-60% of the plants have symptoms, the test rows are sown, together with an occasional row of a highly susceptible cultivar to act as a check on the effectiveness and uniformity of the challenge to the test rows. 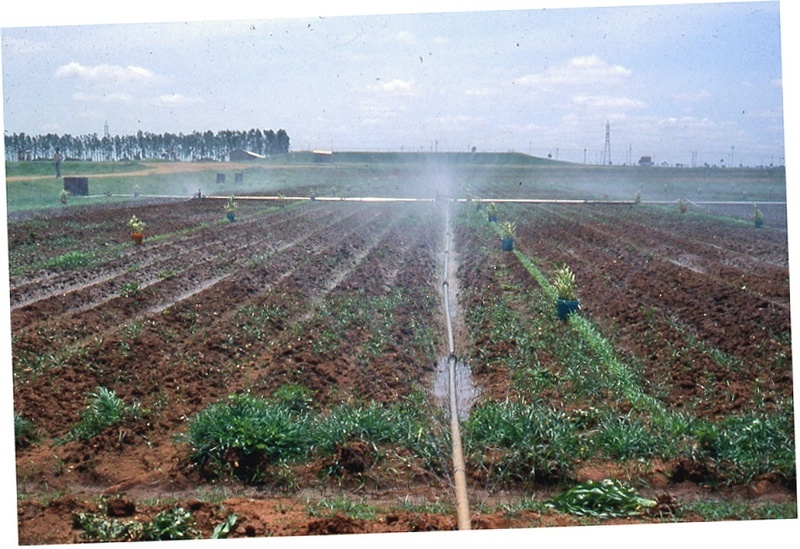 This screening technique enabled the screening for resistance of thousands of germplasm lines and breeding materials of pearl millet so that resistance could be identified and incorporated into advanced breeding lines to develop downy mildew resistant cultivars with high yield and high-quality grain. 1.3 Can downy mildew resistance be identified in the laboratory or greenhouse? A glasshouse screening technique has been developed in which potted seedlings are inoculated at the coleoptile stage with a suspension of sporangia and kept in high humidity at about 25 C for infection and disease development. The technique is precise, independent of the season, and both time-efficient and cost-effective. The technique has been used to screen breeding lines for resistance to downy mildew and to study pathogenic variability within the pearl millet pathotype. 1.4 What progress has been made in finding and using host-plant resistance to pearl millet downy mildew? In the ICRISAT Pearl Millet Improvement Programme more than 3,100 pearl millet germplasm accessions from about 25 countries were screened for resistance to downy mildew in the period from 1977 to 1992, and 428 accessions were detected with high levels of downy mildew resistance combined with a flowering time of 45 to 60 days. 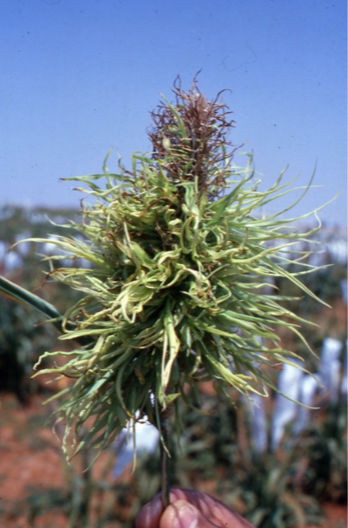 Selected sources of downy mildew resistant pearl millet lines were combined at ICRISAT to produce open-pollinated varieties that were released for cultivation in India. One of these, WC-C75 has been cultivated by Indian farmers since 1983 in nine Indian states covering a total of more than 1 million hectares. In India, the national All India Coordinated Millet Improvement Programme of the Indian Council of Agricultural Research has identified many sources of resistance to downy mildew in pearl millet and used the resistance to develop high-yielding downy mildew resistant hybrids and cultivars. These have been multiplied and distributed to farmers through the national seed production system and also by indigenous private sector seed companies. In West Africa, ICRISAT in collaboration with the Institute National d'Etude et de Recherche Agricole (INERA) in Burkina Faso has developed several promising downy mildew resistant pearl millet varieties such as the IKMP series. 1.5 Have sources of resistance been identified that are effective at locations throughout India and West Africa? The International Pearl Millet Downy Mildew Nursery (IPMDMN), coordinated by ICRISAT in cooperation with scientists in national research programmes enabled the screening of pearl millet lines for stability of resistance at many locations in West Africa and India over several years. More than 50 pearl millet lines were identified with stable downy mildew resistance across locations and years. Many of these lines originated from northern Nigeria. In West Africa a regional downy mildew screening programme, the West African Downy Mildew Nursery, testing pearl lines contributed by national research scientists at disease "hot spots", identified pearl millet lines with resistance that was effective across the region. 1.6 Is there evidence of resistance "breakdown" by new pathogenic races when resistant cultivars are widely grown? In India, some downy mildew resistant F1 hybrids, which are genetically uniform, have become susceptible to the disease after their widespread use, as the pathogen has responded to the selection pressure of the resistance. In contrast, the genetically diverse open-pollinated pearl millet cultivars such as WC-C75 have retained their downy-mildew resistance when grown widely for several years over large areas. It is assumed that the genetic heterogeneity of open-pollinated varieties provides a buffering against virulence shifts by the downy mildew pathogen. These varieties will not remain totally disease free, but neither is it likely that damaging epidemics of downy mildew will develop. 1.7 What strategies are recommended for the use of downy mildew resistant pearl millet F1 hybrids, to avoid resistance breakdown? The deployment of a single F1 hybrid for several years over a large area is likely to lead to the breakdown of the resistance. ii. deploy different hybrids sequentially over time. For these strategies to be effective several desirable hybrids with different resistance genotypes must be available and there would need to be a co-ordinated system of seed production and distribution servicing an informed community of farmers. 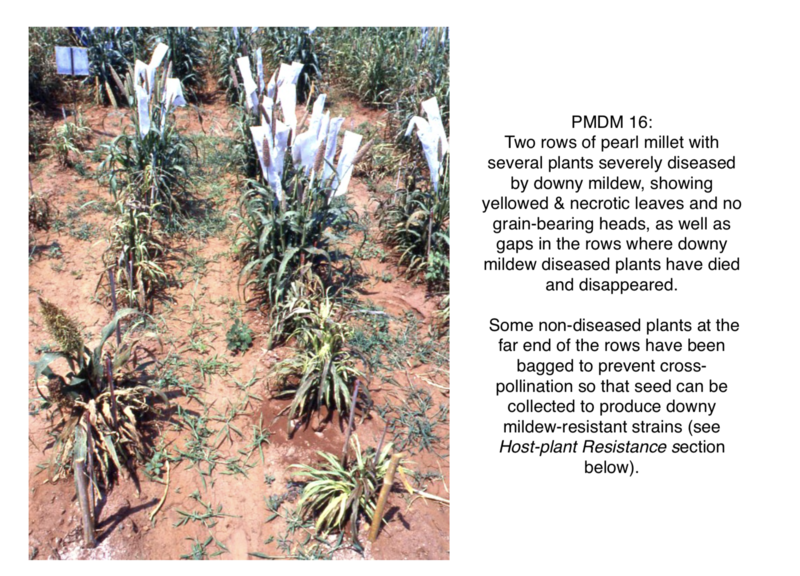 1.8 What is "recovery resistance" to downy mildew in pearl millet? Research at ICRISAT has identified pearl millet lines in which infected young plants appear to outgrow the pathogen and produce normal grain-bearing heads. This phenomenon has been termed recovery resistance. Selection within pearl millet lines demonstrating some plants with apparent recovery resistance has produced lines with up to 95% of the plants which although infected and showing symptoms of the disease at the vegetative stage go on to develop normal grain-bearing panicles. The value of this recovery resistance is not clear though it has been theorised that the use of such recovery resistance in F1 hybrids may enable the prolonged use of the hybrids with a to reduce risk of resistance breakdown. 1.9 From where are resistant varieties available? High-yielding downy mildew resistant cultivars of pearl millet have been developed by ICRISAT (http://explorer.icrisat.org/page/pearl_millet/680/275) and several national agricultural research organisations, as well as by private-sector seed companies. Growers wanting access to these cultivars need to contact the national agricultural research and extension services in their country for advice on availability and use strategies. 2.1 Can fungicide seed treatment control pearl millet downy mildew? 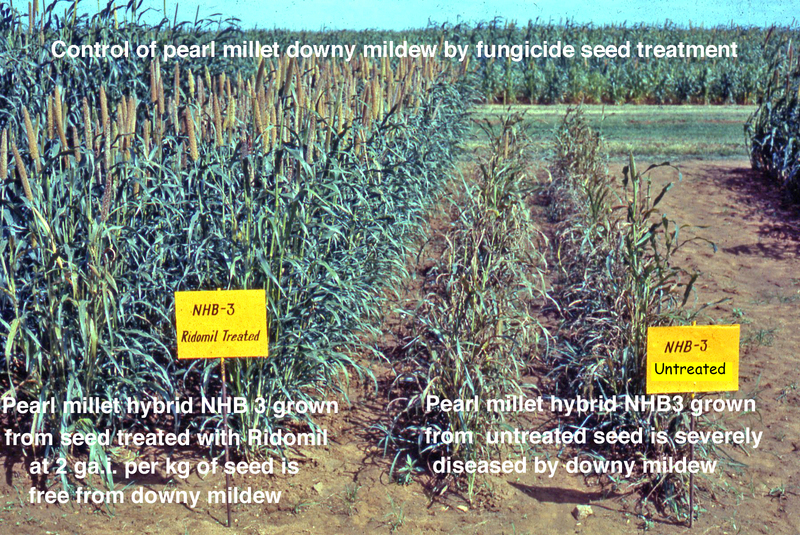 Complete control of pearl millet downy mildew can be achieved even in highly susceptible cultivars by seed treatment with appropriate fungicides (Fig 32). 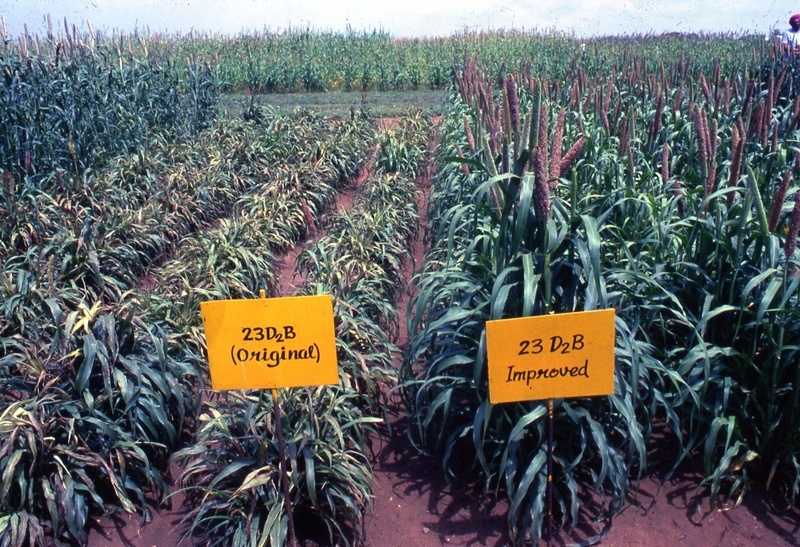 2.2 Which fungicides are effective as seed treatments for controlling pearl millet downy mildew? High levels of control of pearl millet downy mildew have been achieved by seed treatment with fungicides containing the active ingredients metalaxyl (e.g Apron SD 35) and mefenoxam (e.g Apron XL). The active ingredients metalaxyl and mefenoxam move systemically within plants grown from treated seed which makes them ideal for the control of the systemic pearl millet downy mildew. Apron 35 SD has been highly effective when applied at the rate of 2 g active ingredient per kg seed. The treatment process is simple and only small quantities of the fungicide are needed. The fungicides based on metalaxyl and mefenoxam are patented and registered for use by Syngenta Crop Protection from where further information on the products, where they are registered for use, their environmental impact etc. can be obtained. Effective control of pearl millet downy mildew has also been reported on an experimental basis by seed treatment with a formulation (Melody® Duo) of the fungicide active ingredient Iprovalicarb. However, it is registered and recommended for use only as a foliar spray in potato and grape crops. There are reports of downy mildew control with foliar sprays of systemic fungicides, particularly those containing metalaxyl as the active ingredient. However, the use of foliar sprays has no advantage over seed treatment in terms of level of control achievable, and has several disadvantages in that it requires the farmer to have spraying equipment and the means to make up the spray at the correct concentration, it exposes the farmers and the environment to spray drift and contamination, and it is likely to be more expensive. 3.1 What do farmers need to take effective on-farm actions? Knowledge is the Key. If farmers have information on the nature of the factors adversely affecting their crop, how these factors damage the crop and what is known on how to reduce the damaging effects, then the farmers will be able to find ways that work for them, using the resources available to them within their operating environment. This leads to locally-effective and achievable Integrated Pathogen Management (IPM). 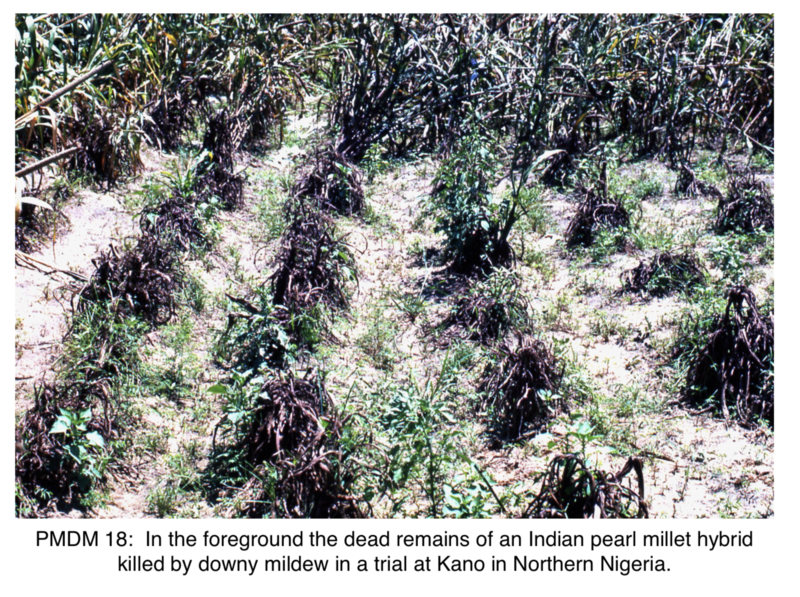 3.2 What actions can farmers take to reduce the problem of pearl millet downy mildew? The key on-farm actions that farmers can take are sanitation and selection. c) ensure seed for next year's crop is selected from robust disease-free plants. 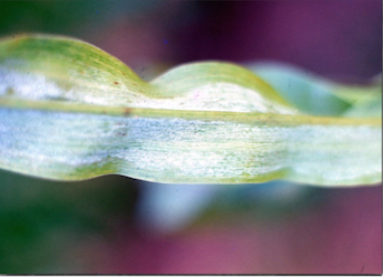 3.3 What are the benefits of removing downy mildew diseased plants? 3.4 How can farmers increase levels host-plant resistance to pearl millet downy mildew in their local cultivars? These actions should reduce the level of susceptibility in the local cultivars gene pool, and lead to the development of a population of locally downy-mildew resistant cultivars. 3.5 Why is community action beneficial for the control of pearl millet downy mildew? Integrated pathogen management will be more effective if done on a community basis rather than by individual farmers acting alone, as sporangia causing secondary spread and pollen from diseased plants can be carried to neighbors' fields. The basis for effective on-farm actions is for all the farmers in the community to fully understand the biology and epidemiology of pearl millet downy mildew and work together to reduce the levels of the disease. • Practise on-farm sanitation to: a) reduce secondary spread; b) reduce oospore reservoir in soil; c) prevent oospore contamination of seed; d) delay build-up of pathotypes that can break down resistance and resist fungicides; e) build up resistance levels in local cultivars. This references section is not exhaustive but provides key sources of research information that informs and supports the statements and suggestions given. Ball, S. L. 1983. Pathogenic variability of downy mildew (Sclerospora graminicola) on pearl millet I. Host cultivar reactions to infection by different pathogen isolates. Annals of Applied Biology 102:257-264. Ball. S.L., Pike, D. & Burridge, C. 1986. Characterisations of populations of Sclerospora graminicola. Annals of Applied Biology 108: 519-526. Michelmore, R.W., Pawar, M.N. & Williams, R.J. 1982. Heterothallism in Sclerospora graminicola. Phytopathology 72:1368-1372. Rachie, K.O. & Majmudar, J.V. 1980. Pearl millet. The Pennsylvania State University Press. 307 pp. Sharma, R., Upadhyaya, H.D., Sharma, S., Gate, V.L. & Raj, C. 2015. New Sources of Resistance to Multiple Pathotypes of Sclerospora graminicola in the Pearl Millet Mini Core Germplasm Collection. Crop Science 55:(4) 1619-1628. Singh, A.K., Rao, V.P., Rai, K.N., Kulkarni, V.N. & Thakur, R.P. 2004. Effectiveness of Within-progeny Selection for Downy Mildew Resistance in Pearl Millet. International Sorghum and millets newsletter, 45. Singh, S.D. 1995. Downy mildew of pearl millet. Plant Disease 79: 545-550. Singh, S.D. & Gopinath, R. 1985. A seedling inoculation technique for detecting downy mildew resistance in pearl millet. Plant Disease 69: 582-584. Singh, S.D. & King, S. B. 1988. Recovery resistance to downy mildew in pearl millet. Plant Disease 72: 425-428. Singh, S.D. & Williams, R.J. 1980. The role of sporangia in the epidemiology of pearl millet downy mildew. Phytopathology 70: 1187-1190. Singh, S.D., King, S.B. & Werder, J. 1983. Downy mildew disease of pearl millet. ICRISAT information Bulletin no. 37, 30 pp. Thakur RP, Rao VP, Wu BM, Subbarao KV, Shetty HS, Singh G, Lukose C, Panwar MS, Sereme P, Hess DE, Gupta SC, Datta VV, Panicker S, Pawar NB, Bhangale GT and Panchbhai SD. 2004. Host resistance stability to downy mildew in pearl millet and pathogenic variability in Sclerospora graminicola. Crop Protection 23 (10): 901- 908. Weltzien, E. & King, S.B. 1995. 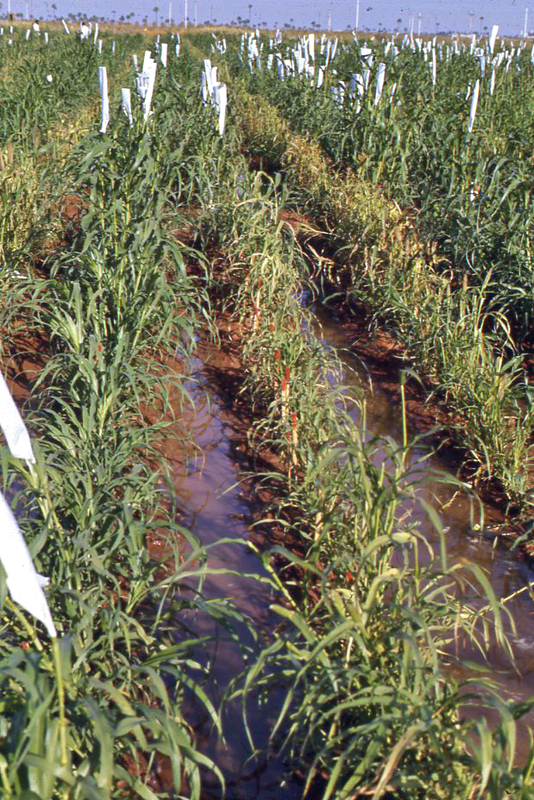 Recurrent selection for downy mildew resistance in pearl millet. Plant Breeding 114: 302- 312. Werder, J. & Ball, S.L. 1992. Variability of pearl millet downy mildew (Sclerospora graminicola) and its implications for breeding for stable and durable resistance. Tropical Pest Management 38 (1): 43 - 47. Williams R. J., Singh, S. D. & Pawar, M.N. 1981. An improved field screening technique for downy mildew resistance in pearl millet. Plant Disease 65, 239 - 241. Williams R. J. & Singh, S. D. 1981. Control of pearl millet downy mildew by seed treatment with Metalaxyl. Annals of Applied Biology 97: 263 - 268. Williams, R. J. & Andrews, D. J. 1983. Breeding for disease and pest resistance in pearl millet. FAO Plant Protection Bulletin, 31 (4), 136-158. Williams, R. J. 1984. Downy Mildews of Tropical Cereals. Advances in Plant Pathology 2: 1-103.